The peak time for a heart attack is between 6:00 A.M. and 12:00 noon. Each year, more than a million people in the U.S. have a heart attack, and about half of them die. Of those who die, about half of them do so within 1 hour of the start of symptoms, and before reaching the hospital. 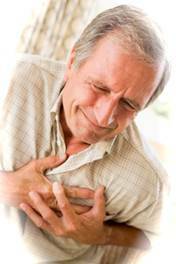 • It is usual that a heart attack is a problem where “plaque” has formed at the site of an injury to an arterial wall. An MI is typically due to a blood clot (thrombus) in one of the coronary arteries, which supply oxygen to the heart. The clot forms when the plaque ruptures, blocking the artery (thrombosis) and cutting off the oxygen supply to the heart. In fact, atherosclerotic plaque rupture with thrombosis is present in coronary arteries of 80-90% of fatal MIs. • The life quality and longevity of an MI survivor is mainly determined by the amount of damage done to the heart muscle. If treatment is not started quickly, the affected area of heart muscle begins to die. If a person survives a heart attack, the injured area of the heart muscle is replaced by scar tissue, which weakens the pumping action of the heart and can lead to heart failure and other complications.